Get help to stop the domestic violence cycle and do not let the pattern of abuse continue. Do not think that you can make up with your partner. Do not be fooled by the calm before the storm. And, do not allow tension to build until the next incident of abuse occurs. Only genuine intervention will stop the process. Phases 1 and 2 together are sometimes referred to as the Honeymoon Phase. Couples enter into a relationship with high hopes and great expectations. They believe they have found the perfect partner with the potential of a long life together. It can begin with a casual meeting and grow into dating. After dating may come the plan to begin a permanent relationship. During initial dating or during the beginning of a permanent relationship, the partnership may be in a period of calm known as the Honeymoon Stage. However, some partners are abusive and are a ticking time-bomb of violence waiting to erupt. Usually, the signs are present, but difficult to recognize until actual violence occurs. Any kind of emotional or physical abuse should be evaluated carefully. 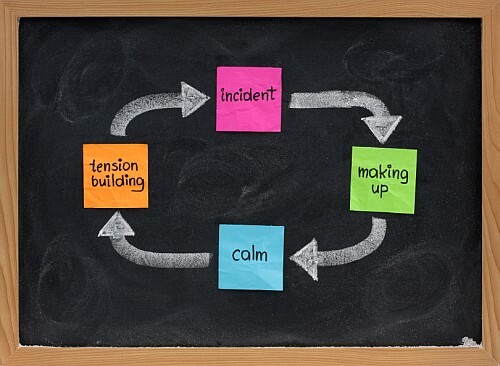 In the domestic abuse cycle, tension builds in the tension phase, and ultimately and incident occurs in the explosion phase. There is no specific length of time for any of the phases, but they all exist in every domestic violence cycle. The main issue to remember is that a circle has no beginning and no end unless you break the cycle. The cycle of domestic violence is a nasty circle. The pattern will repeat itself, and the abused will not succeed in transforming the abuser into the person they once were. The physical abuse is seldom a onetime event. As time goes on, the abuse can escalate. An abused woman should seek physical and emotional help when the abuse begins to make the woman feel insecure. When the feelings of low self-esteem escalate, the woman needs to move out of the relationship. The hope of renewal is unhealthy and seldom becomes a reality. It is time to move on and seek help. If a victim does not seek domestic violence help, the honeymoon stage will begin again with a period of making up and a period of relative calm. Then tension will build, and eventually another explosion of violence and abuse will occur. Continue reading about the four phases of the domestic abuse process. Look at some of the stories that follow. Can you identify what point in the abuse process these victims are currently in? Click on some of the stories that follow. Can you identify what point in the abuse process these victims are currently in?